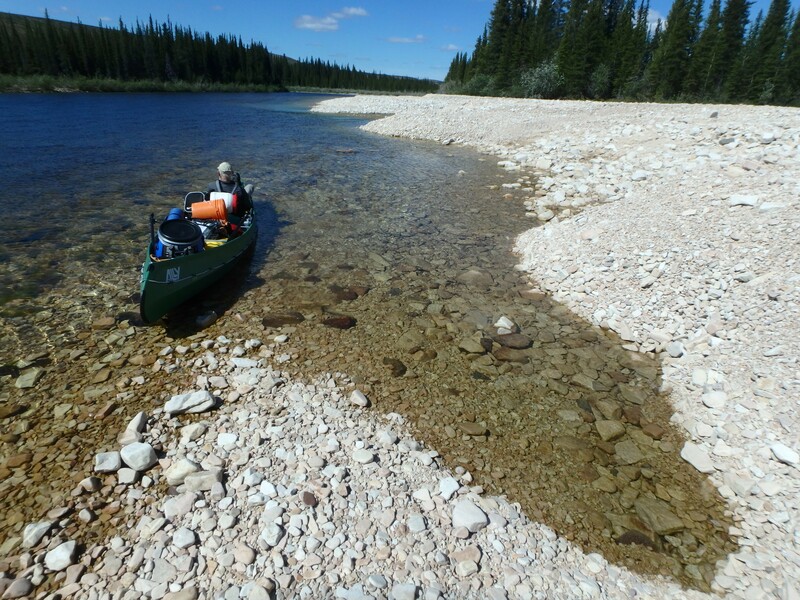 THELON & ELK RIVERS: This will be an early summer trip along one of Canada’s most beautiful and remote rivers. Starting on the rarely-traveled Elk River, we’ll paddle for about a week and a half down this stunningly beautiful and fast-flowing tributary of the iconic Thelon River. There will be lots of fun swift paddling along this river with minimal portaging — likely no more than 3 along the whole trip. 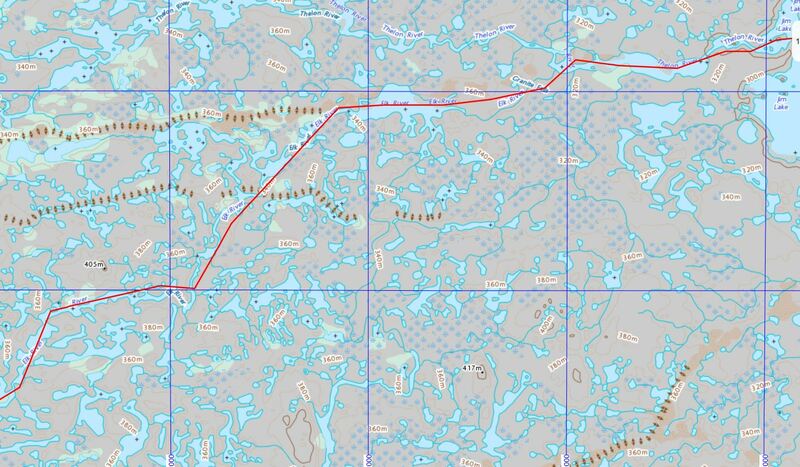 We will be traveling by and large north of the treeline in a beautiful land of canyons and eskers. A wide variety of flora and fauna can be seen along the trip. We would hope to see muskox, caribou, wolves, fox, moose, bear in addition to many types of waterfowl and other arctic birds. 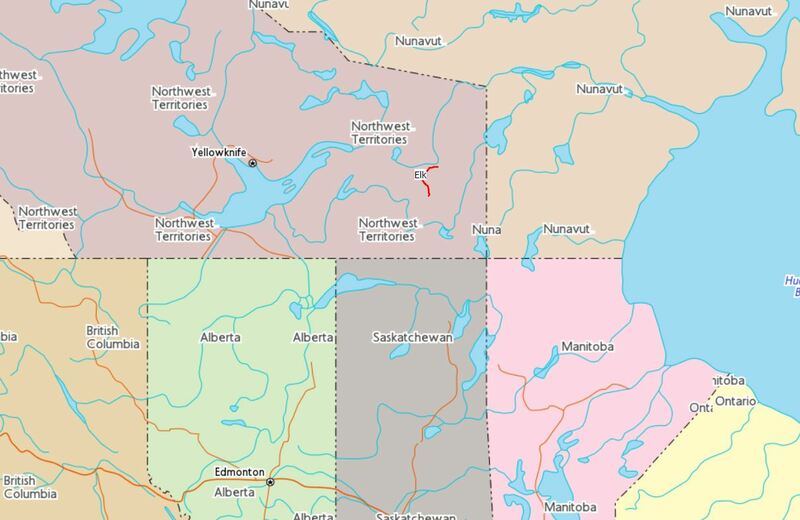 The trip will start & end from Stoney Rapids, Saskatchewan. The Elk is a southern tributary of the famous Thelon River. It has its source in the land of little sticks near the upper limits of the treeline. It flows out of three large lakes (Vermette, Rennie and Damant) and proceeds north 200km to the Thelon River, above the Thelon Gorge. All 3 lakes are possible starting points for the trip. 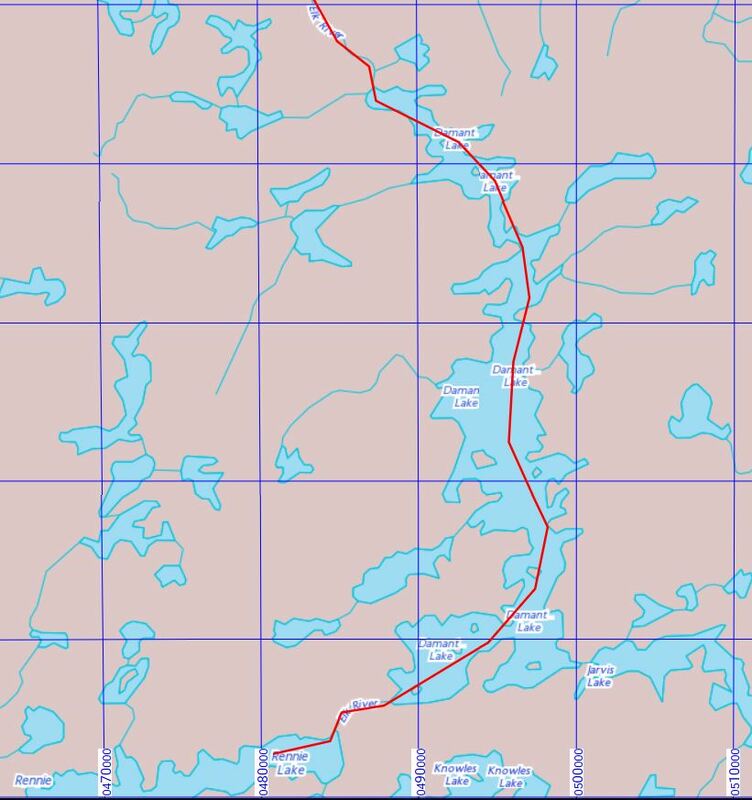 Our trip will begin at the narrows at the northeastern end of Vermette Lake as it flows into Rennie Lake. We will fly into here by floatplane from Stoney Rapids Saskatchewan. The Elk is a river that cuts its way through the Precambrian Shield in a series of scenic rapids and cataracts. As it makes its way rapidly northward beyond the large lakes it becomes a very classic pool and drop river with numerous swifts, class I and II technical rapids. There are a few larger class III rapids and the occasional chute and falls. 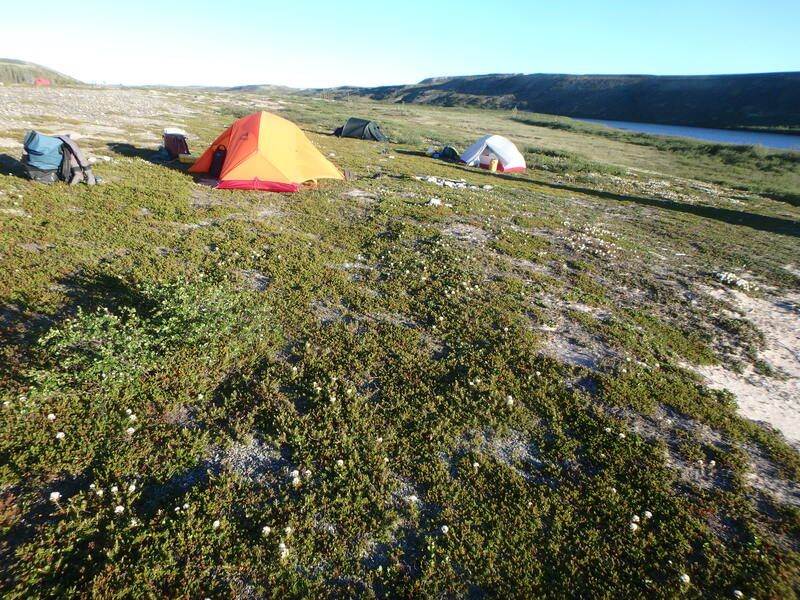 This is a land of canyons and eskers with great camping, stunning scenery & excellent hiking/walking. The Elk dumps into the Thelon River at “Granite Falls” falls a spectacular cataract containing eight or more major steps and stretching more than a kilometer in length. 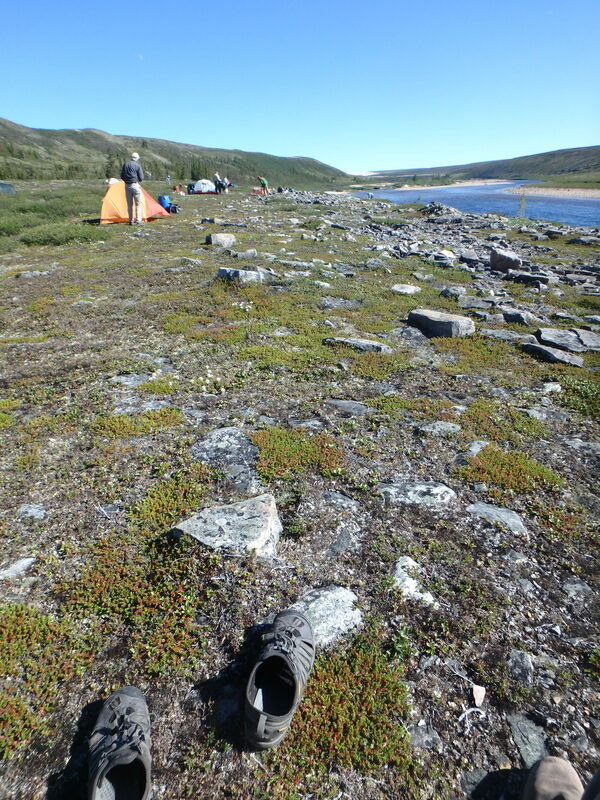 This one is a portage, but very near the end of the trip so the gear is light. The Elk has many fun runnable rapids for the intermediate canoeist. 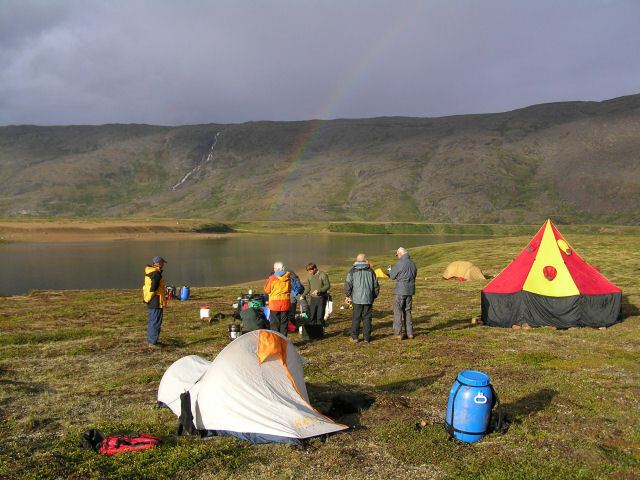 In addition, it offers remoteness; great fishing and ample opportunities for wildlife viewing. Trips often see caribou, wolf, moose, fox, and bear. We are going early to get maximum water flow on the upper river, to enjoy the early summer wildflowers and to get maximum daylight, and warm temperatures (we hope). Water temperatures though will still be cold. Large lakes are often still frozen this time of year, and the small lakes where we land will only have been ice-free for a few weeks. The Thelon area has been uninhabited for many generations, but there is still ample evidence of where Native groups used the river. We will see tent rings and other evidence of past use. Previous camping and canoeing experience is required, and it is helpful to have had basic whitewater instruction. Day 2-4: Rennie Lake, Elk River, Damant Lake to Elk River exit. 60 km, 1 swift & 1 Class 1 rapids. Scenic paddle, many islands bays inlets, Lovely campsites. Great hiking and fishing. Day 5 (km 20): Where the Elk River exits Damant Lake there are a set of rapids and swifts. The first set of rapids is class I or II and can be run easily just avoid the ledge. The set of swifts comes up a short distance later and is run with a rock garden at the bottom, a bit of a bump and grind in low water. The river widens into a lake expansion after the swifts. After the lake expansion, the river narrows. Here there are a series of technical, but runnable, class II rapids. boulders to the right and left of the main tongue. The next set, class II is runnable. Following this is a chute with a meter drop. Depending on water-levels we may run, line or lift around. Some swifts and class 1 rapids follow. A campsite occurs where the river opens into a small lake. Day 6 (km 7): Beyond the small lake there are a series of rapids and a chute where the Elk begins a northwesterly direction opening up into a lake expansion to the west. The first two of these we will run, the 3rd may be run or lined. The 4th probably lined. 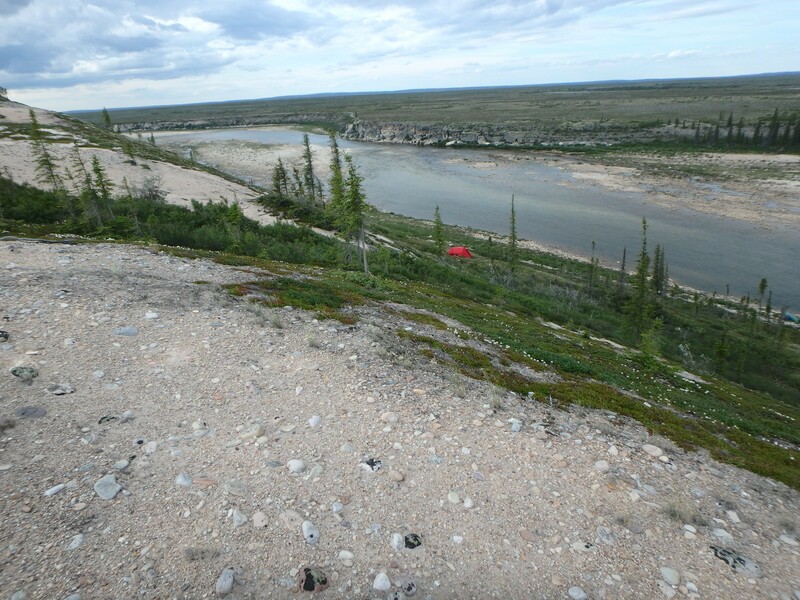 After the rapids, there is a sand esker on river right which makes for a great campsite and offers wonderful walking/exploring options, often with nesting birds and sometimes a fox or wolf den. 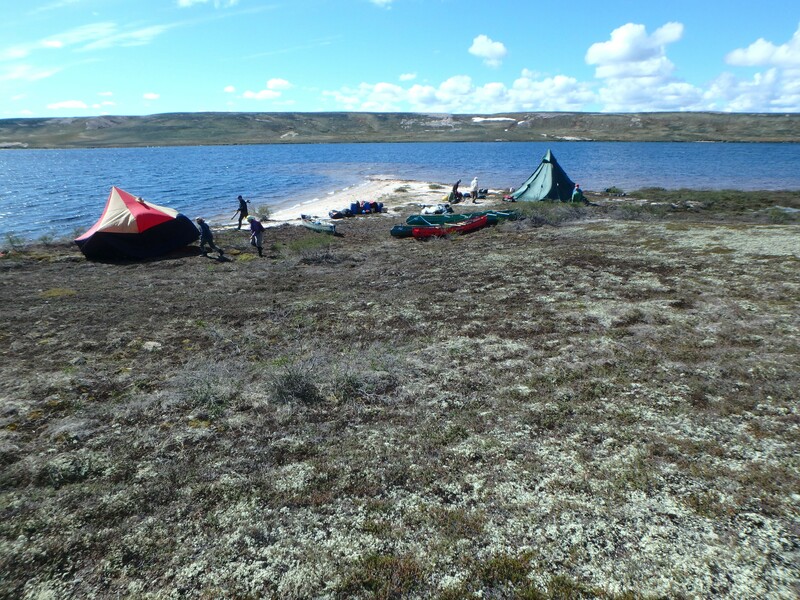 Day 7 (km 21): After the westerly paddle across the mid-sized lake the river narrows and swings back to the northeast. There is a set of class II rapids here that is runnable. From here the river opens into a set of lake expansions. At the end of these expansions the river narrows into another set of rapids. There is an excellent campsite here on river right. As with most of the Elk River the fishing is excellent. Grayling for supper? Day 8 (km 29): The rapids near the campsite are class II and can be run. A swift follows below the rapid and then a longer rapid (class 1-2 with a complete “S” bend. Often these rapids are scouted as they are long and hard to see. 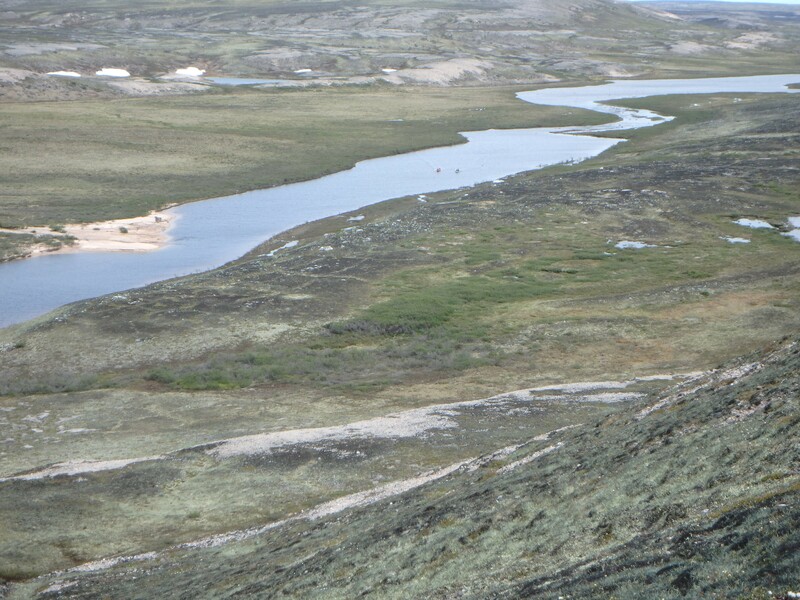 The next section of the river is above the tree line and the tundra is more exposed. The river has a current, so paddling becomes a lot easier than that on the large lakes. Day 9 (km 26): The river in this section begins with swifts and straightforward class I rapids through stunning beautiful small canyons. These rapids can be run on the fly with boat scouting. It is a great fun section of the river, routes are easily visible and non-technical. The topography in this section is characterized by canyons and dramatic white sand eskers. As you approach a narrowing of the river following the lake beautiful Granite cliffs are visible. Here, where the river takes an easterly swing there begins a long set of rapids that continues 2 km. through a series of bends. The rapids are class II+ (III-III+ at some levels). At some levels, they can be run/lined. We may make camp here. Day 10-11: Granite Falls Portage. 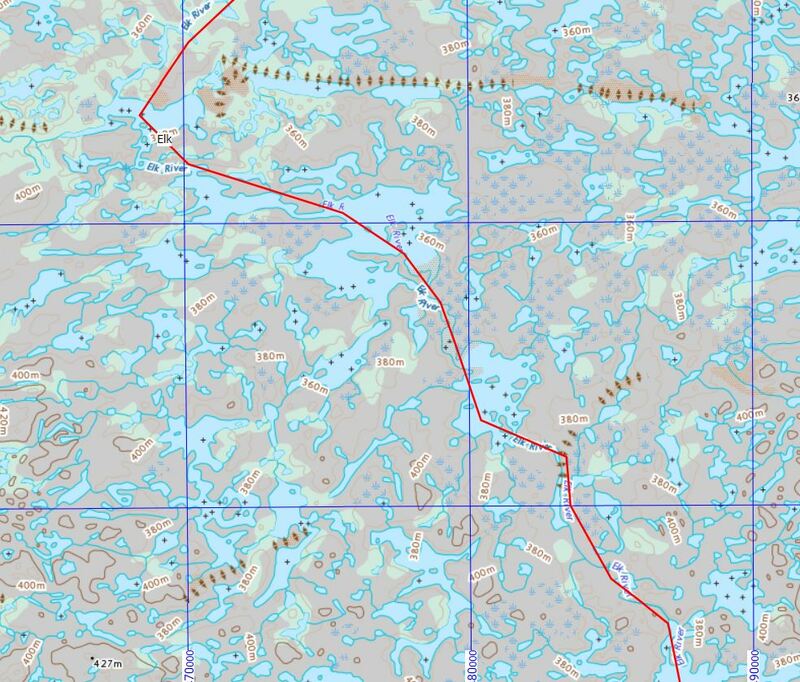 We’ll continue down the Elk to Granite falls and make the 1.5km portage around Granite Falls to the Thelon River. This is a wonderful place to camp/fish/Explore. This is an impressive 7 or 8 step cataract through which the water drops 15+m. 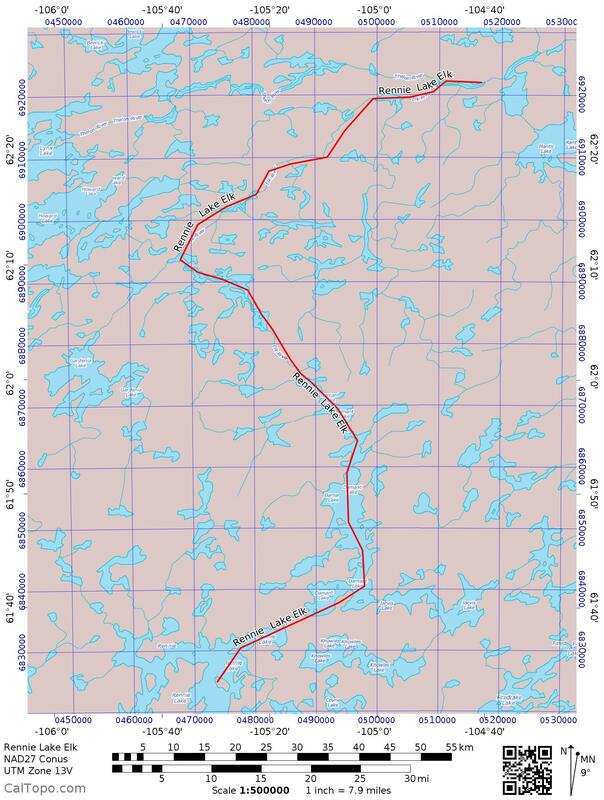 Day 12 (km 15), Granite Falls to Jim Lake. The final day will be spent paddling down the mighty Thelon from Granite Falls to Jim Lake. Day 13: Charter floatplane pickup back to Stoney Rapids.